FC can be raised in many different ways. We recommend using either bleach, liquid chlorine, or a SWG. SLAMing the pool should always be done with bleach/liquid chlorine, since a SWG can not raise the FC level quickly enough. 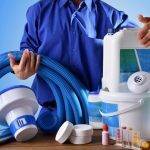 See How to Chlorinate Your Pool for a list of the pros and cons of all of the available choices. You want common household bleach, without any additives or special features, typically labeled unscented or “original scent”. Bleach is available in various strengths, labeled by percentage. The most common strength is 8.25%. The higher the percentage, the less you need. For example 2 cups of 3% bleach contain the same amount of disinfecting chlorine as 1 cup of 6% bleach. Avoid bleach that does not list a percentage, as it is usually a rather low percentage. The best deals on bleach are often at Aldi supermarkets or WalMart. Avoid buying bleach at dollar stores, as it is almost always quite old and will have lost most of it’s strength. Liquid chlorine is exactly the same chemical as bleach. It is normally sold in higher concentrations, typically 10% or 12.5%, which are easier to carry than bleach. Liquid chlorine is not available in all areas. Ask your pool store if they carry it. Liquid chlorine is often less expensive than bleach, once you take it’s higher strength into account. For the rest of this section I will refer to both bleach and liquid chlorine as bleach. Bleach loses strength over time, more quickly when it has a higher percentage and when it is stored at higher temperatures. You should store bleach in a cool dark place. 6% bleach can reasonably be stored for about six months. 12.5% bleach can reasonably be stored for about one month. After that time it is still usable, but will have lost some of it’s strength. Bleach should be added to the pool by pouring slowly in front of a return jet with the pump running. You should pour slowly enough that pouring an entire jug takes more than one minute, preferably two minutes. Leave the pump running for at least 30 minutes after adding bleach. To lower pH you can use either muriatic acid or dry acid. Muriatic acid is less expensive, though it can be annoying to handle. It is best to use muriatic acid if you have a SWG. If you don’t have a SWG, and handling muriatic acid bothers you, you can use dry acid. Muriatic acid is sold by most hardware stores and some paint stores. The big box hardware stores, like Home Depot and Lowes, almost always have it, but they seem to put it in different departments from store to store. Sometimes it is outside in the garden department, sometimes in pool supplies, and sometimes in the paint department. Muriatic acid is available in various strengths. The most common strength is called either 20° baume or 31.45%. 10° baume or 15.725% is easier to handle but you need twice as much and it is usually more expensive. You should always wear eye protection when handling muriatic acid. You do not want to breathe muriatic acid fumes. If you spill any on your clothes it will cause damage. Muriatic acid may sting a bit if you get it on your skin, but won’t normally cause any serious harm as long as you rinse it off right away. Muriatic acid should be added to the pool by pouring slowly in front of a return jet with the pump running. You should pour slowly enough that pouring an entire jug takes more than two minutes. Leave the pump running for at least 30 minutes after adding muriatic acid. Dry acid is sold by pool stores and the pool departments of some big box stores. Dry acid is sold under various names, including PH Down, PH Reducer, PH Decreaser, Lo-n-Slo, etc. Dry acid is best added by pre-dissolving it in a bucket of water and then pouring that slowly in front of a return. PH can be raised in three ways: borax, soda ash, and aeration. Borax is usually the best choice. Borax raises the PH and also raises the TA level just a little. If your TA level is low soda ash will raise both the PH and TA levels. If your TA level is high, aeration is best as it will not raise the TA level at all. However, aeration is rather slow compared to the other two. Borax is available as 20 Mule Team® Borax Natural Laundry Booster. It is sold in the laundry detergent section of most larger grocery stores and some big box stores. Borax is best added by pre-dissolving it in a bucket of water and then pouring that slowly in front of a return. Soda ash is available as ARM & HAMMER® Super Washing Soda Detergent Booster. Do not confuse this with ARM & HAMMER® laundry detergent! It is sold in the laundry detergent section of most larger grocery stores and some big box stores. It is also sold by pool stores under various names, including PH Increaser, PH Up, Balance Pak 200, etc. Soda ash is best added by pre-dissolving it in a bucket of water and then pouring that slowly in front of a return. Aeration can be provided by a SWG, spa jets, waterfall, fountain, return pointed up so it breaks the surface, air compressor, kids splashing, rain, etc. It can take some time for aeration to raise the PH. The higher your TA level, the faster aeration will work. TA is raised by adding baking soda. For directions on lowering TA see How to Lower Total Alkalinity. Baking soda is common household baking soda from the baking aisle of any grocery store. If you can find them, larger containers are less expensive per pound and easier to handle. Some larger grocery stores sell baking soda in 4 lb boxes and some big box stores have it in 12 lb bags. Baking soda can be added by spreading it across the surface of the deep end of the pool. Calcium hardness can be raised with calcium chloride or calcium chloride dihydrate. They are available in some areas as Peladow, Dowflake, Tetra Flake, or Tetra 94, often sold as a deicer by hardware stores, and some big box stores, in colder climates. Pool stores will carry either calcium chloride or calcium chloride dihydrate under a variety of names, including Hardness Plus, Balance Pak 300, Calcium Hardness Increaser, etc. Calcium products should be spread across the surface of the deep end of the pool. CYA can be raised with cyanuric acid. Cyanuric acid is sold under a variety of names, including Stabilizer, Conditioner, Instant Pool Water Conditioner, Stabilizer 100, Stabilizer & Conditioner, etc. Instant Pool Water Conditioner is a liquid product which is significantly more expensive than the other forms. Solid/granular cyanuric acid (CYA) should be placed in a sock and the sock put in the skimmer basket or suspended in front of a pool return. After adding CYA you should leave the pump running for 24 hours and not backwash/clean the filter for a week. Squeezing the sock periodically will help it to dissolve faster. Test and dose chemicals in your pool assuming the amount of CYA added is in the pool according to Poolmath. CYA can be tested the day after it is fully dissolved from the sock. The best thing to use to raise the salt level is water softener salt. Look for salt that is 99.4% pure or better and doesn’t have any rust inhibitor or other additives. The best choices include Diamond Crystal® Solar Salt Extra Coarse Crystals in blue bags, Morton® White Crystal® Water Softener Salt in blue bags, or Diamond Crystal® Sun Gems® Crystals Water Softener Salt in yellow bags. Water softener salt pellets will also work. Pellets dissolve more slowly, but still dissolve quickly enough to be fine. Pool salt is also fine to use, though it tends to be much more expensive. Potassium chloride will also work, but you need 28% more of it and it is more expensive. Avoid table salt, rock salt, and deicing salt. Salt can simply be dumped into the pool. Spread it around a bit with a brush so there aren’t any large piles, and leave the pump running for 24 hours after adding salt. If you have a SWG, it should be turned off while you are adding salt and for the next 24 hours. The borate level can be raised with a combination of borax and muriatic acid, or with boric acid. Borax is described above under raising PH. Muriatic acid is described above under lowering PH. Boric acid is available over the internet from places such as The Chemistry Store and AAA Chemicals. 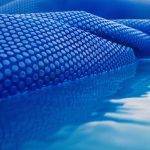 For further information on borates see So you want to add borates to your pool–Why and How.